Advance Scraping Company has the technical skill necessary to rebuild your Fadel CNC machine or other machines regardless of the size and type. With the use of our precision equipment and applied methods, we can remanufacture your valuable machine to perform at a new machine tolerance, and we are able to do it at a fraction of the cost. 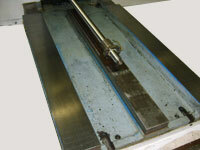 Building new machinery or building slide units or fixtures that need scraping is our specialty. Scraping procedure spreads the points of bearing contact evenly across the ways, while achieving geometric alignment, flatness, parallelism, and squareness. High and low points provide oil reservoir very important for accuracy, repeatability, and longevity. When machine ways are not scraping in flat to each other and fitted properly, dirt and chips work their way in and scoring of the way appears. (see rebuilding of score ways) All machines are made of cast iron because of its characteristics cast iron will always remain and hold tolerance, through the extreme cold or hot temperature.